Planning a home remodel? Blogger Mary Beth says organization is key. Remodeling your home can be a very stressful and expensive experience. Whether you’ll be remodeling your whole home or just doing a room remodel, you will likely need to make some pretty major adjustments. Staying organized during the remodeling process will help alleviate stress. It will also help you keep projects on a strict timeline. Most importantly, it will allow you to ensure you are getting the renovation you imagined. To help you through the process, we’ve compiled a list of ways to stay organized during your home remodel. Before you even get started on your home remodel, you first need to decide what you want to be done in your home. The easiest way to do this is the start a Pinterest vision board. You can either break each room down into its own board or make one large board for your entire home renovation. Pinterest is convenient because if you see a fixture or item that you love, you can click on the pin and immediately buy the item. Another option is to look through magazines for inspiration. When you find something you like, rip out the page. Once you have what you need, purchase an accordion folder. Label each section by room to stay organized, and put everything that inspires you into that section. This will come in handy when you need to quickly pull for reference during remodeling. Remodeling your home will be a huge expense, so make sure you put it in the hands of someone you trust. Don’t settle for the cheapest home remodel contractor or the first home remodel company that shows up on Google. Take the time to do your research and check out their credentials. First, make sure they have at least three years of experience, if not more. Next, check their standing with the Better Business Bureau and make sure they are accredited. Look for reviews on them and make sure they have a high rating. If you can, take a look at their past work and make sure it is attractive and high quality. After you choose the right home remodel contractor, have a highly detailed contract written up to protect yourself. Make sure they take responsibility for damages to your home during construction and have their own protection against injury on the job. Your contract should also include your complete address, the start and end date of the home remodel, and specific project details of what they are expected to complete during their contract. Do not allow your contractor to start work before a contract has been signed protecting you and your home. A home renovation can be a huge disruption in more ways than one. Depending on how extensive the home remodel is, you may choose to leave your home for a while. There are some things you will need to think about before beginning remodeling. If you choose the stay, will you have a pathway to your room and bathroom? Will you have access to the kitchen or will you need to budget for takeout? These are just some things to consider when deciding whether or not to stay in your home. You should also consider the level of noise and what hours your home will be worked on. If you have allergies, take into account the dust particles that will be caused by construction. You may also consider leaving your home during renovations. If you don’t have friends or family in the area, you will need to account for a hotel or Airbnb in your budget. Keep in mind, you will likely also be eating out during this time, so plan to spend more money on food as well. If you have an animal, you may need to look into accommodations for them while you are remodeling your home. As you pack up everything to move it out of the way during your home remodel, set aside all valuable or breakable items. You should also set aside things like money, important documents, expensive jewelry, and any prescriptions you don’t need every day. Put these items into a climate-controlled storage unit during the home renovations to keep them safe and out of the way. A climate-controlled storage unit is ideal because it is locked, secure, and the temperature and humidity mimic that of a home. If there is anything else you want to protect like rugs or furniture, you can also move them into a unit. Some people choose to move all furniture and other clutter out of their home and into a storage unit while they are remodeling. This makes it easier to move from room to room and accomplish tasks and keeps everything safe from dust and debris. The storage unit size that you need will vary depending on what you choose to store. For an easy reference, check out this storage unit size guide. As you are clearing out your belongings to remodel your home, do some organizing. If you come across anything that is broken, ripped, or stained, throw it out. After you have trashed everything that is not usable, grab a bin for donations. As you go along, look for duplicates – especially in your kitchen drawers and cabinets. Donate all things you have more than one of that you don’t need. If you have too much clutter caused by toys, now is a great time to cut it down. Have your kids help pack up their toys, but tell them to put a specified amount of toys into the donation box. Go through cabinets, closets, and the pantry and get rid of all the clutter you don’t want to come back to when your house is officially renovated. Dust is going to cover every single room you are renovating. There’s no getting around it. Instead of fighting dust, just be prepared for it. Start by taking down all curtains and blinds in rooms that are being remodeled and move them to a safe place. Then, roll up all rugs and cover them with a protective dust cover. Purchase dust covers for all furniture to protect it from collecting dust particles while your home is being remodeled. All contractors should take their own precautions when it comes to protecting your home against debris. It doesn’t hurt to take your own extra precautions, though. 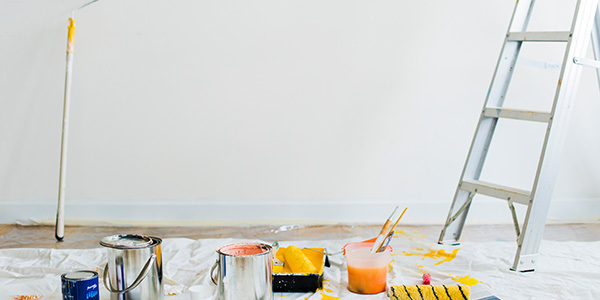 When remodeling your home, plan for the unexpected. Things can – and will – go wrong. When budgeting for your home renovations, budget out an extra 20% of extra cash to cover any extra costs that may come up during the remodel. Next, put together a “just in case kit” and put it somewhere that will be easily accessible. Inside, put a first-aid kit, Gatorade and a granola bar, measuring tape, hand sanitizer, and a few cleaning supplies. This will have you mostly covered in case of small emergencies. Keep all other important necessities in a closet or somewhere out of the way in case you need to access them quickly. The most important thing you can do during a home renovation is staying organized. It is a huge expense and will need your careful oversight to make sure you get your money’s worth. Get organized by creating a home remodel budget after you get a home remodel estimate from your contractor. In Excel or another budgeting software, sit down and section everything out. Consider the cost of the contractor, living accommodations, food, decorations, a storage unit, kennels, child care, and any other costs that might accrue. Keep an open line of communication between yourself and your contractor. Make sure you know what is worked on each day, where projects are at, and if there are any problems. Don’t become a micromanager, but make sure you are aware of everything going on in your home’s renovation. Create a room-by-room home renovation checklist that you can use after the completion of each room to make sure they are done to your liking. Keep plans, paint swatches, and designs somewhere close-by. If you need to reference them quickly during renovations, you should be able to easily grab them. It may also be beneficial to keep all design information on a tablet. Collect all receipts and keep them in a designated envelope or binder. This will help you stay on budget during renovations. Plus, it will come in handy if you are eligible for a home remodel tax deduction. Lastly, organize any and all emails you receive in regard to your home remodel. Create folders for them based on invoices and receipts, design files, contractor information, etc. Now, sit back and enjoy your beautiful new home! Once you have completed all of this, you are on your way to a beautifully remodeled home with half the stress. Staying organized is essential in order to stick to the budget and ensure everything is going according to plan. For more inspiration on remodeling your home, check out our Pinterest. Interested about the idea of using a storage unit during a home remodel? Check out this blog from Cupcakes and Crinoline.